March 6, 2005. I was just 8 years old and I had already forgotten to prepare for Mother’s Day. In a state of guilt and desperation I quickly came to a conclusion, I needed to make my mum a breakfast in bed she’d never forget. Time was of the essence, if she woke up my surprise would have been ruined. I was too impatient to time the boiled eggs, or to clean up the whirlwind of mess an 8 year old tends to make (exacerbated by the tight deadline of 11am, my mum liked to lie in). After successfully making the journey to her bedroom while balancing the heavy tray (and not falling down the stairs) I was ready to present to her my Mother’s Day surprise. Two lukewarm, undercooked boiled eggs, with pieces of eggshell for an extra crunch. Served with spilt orange juice, cold tea and burnt toast. There’s no better way to say I love you than that. They say actions speak louder than words, but sometimes words really count. I realised this when I was selecting women’s stories for All We Can’s Twitter series, #WomanOfTheDay to celebrate International Women’s Day that was early this month. There was one story that particularly struck me, it was Anna’s story. 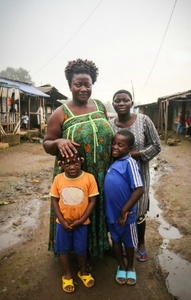 Anna is from Cameroon and became a single mother of three girls when her husband passed away. Anna was determined to give her children a good life, and started her own hairdressing business. She attended training sessions, supported by All We Can which gave her the skills to ensure a sustainable income for her family as a single mother. Anna worked hard to apply the skills she has learnt and now owns multiple businesses. For a 15 year old girl to say this about her mother is incredibly mature and wise. Many mothers work tirelessly for their children out of the love they have for them. Therefore, this Mother’s Day, let us be inspired by Germaine’s words. If your mother, or another inspiring woman in your life, has taken care of you – reflect on what she has taught you, done for you and how she has loved you. If you are a mother, be proud of yourself for bringing children into the world, and showing them unconditional love that does not go unnoticed. Let us also use Mother’s Day as a day to simply celebrate the contribution of women like Anna, ordinary women with extraordinary strength. And a bit of advice to anyone who has forgotten its Mother’s Day… Skip the breakfast and get to the good part. Tell her what she means to you. We wish you all a Happy Mother’s Day from All We Can. As part of a year-long internship with the One Programme, Zoe Carruthers is working for All We Can as its Communications Officer. Zoe studied International Development and Media at the University of East Anglia and is passionate about social justice and womens' rights. Zoe is from Northern Ireland and is keen for others to discover what a beautiful place it is.